Of course these tiles are meant to be used for the outside, they resist all kind of weather conditions and temperatures. The can be easily wall mounted on any surface with mortar or tile adhesive. 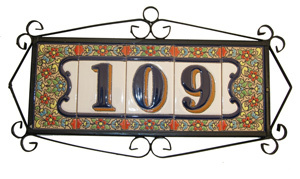 Custom made Metal Frames are available for our Address Tiles upon request. Please email us for more information.